I love a good wardrobe clear out. There’s nothing more cathartic than filling a few bags with clothes you never wear and taking them to a charity shop so they can find new homes, and places where they might actually get use. Changing from having a wardrobe bursting at the seams where there’s some sort of black hole for my favourite dress/top/jeans when I *need* to find them to a rack of clothes that are organised and not so tightly packed that they pretty much suspend themselves without the need for a pole to hang them on is a very good thing. 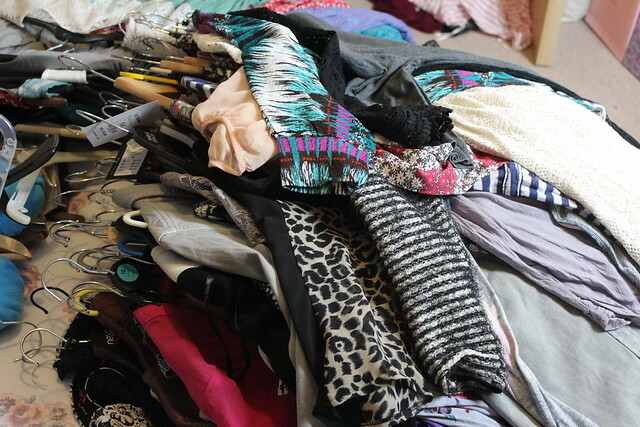 A wardrobe clear-out is rarely a one hour job. It takes a while, and works better if you approach it when you’re not rushed. 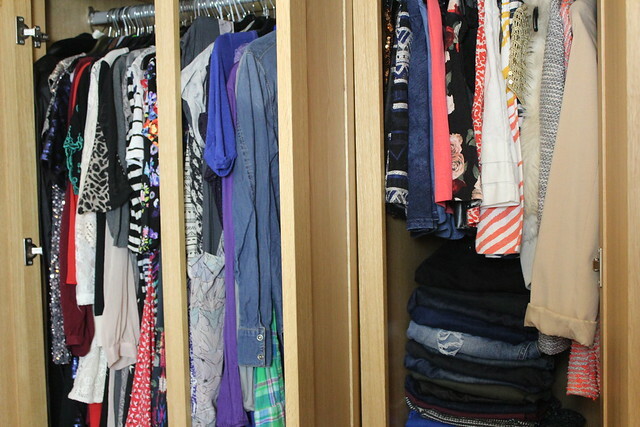 Depending how your stuff is organised, it makes sense to go in phases around where you store clothes. Unless you have more space than me to do this of course! But I tend to go wardrobe, then each drawer of clothes at a time. Pull EVERYTHING out and go through each item one by one. As you decide on keep or get-rid, either chuck it in a black bag (the throw ones) or fold it and put it in a pile with similar items. With the drawers side of things, I have them sorted so I have a drawer for t-shirts and short sleeved tops. One for long sleeved tops, one for jumpers, cardigans and hoodies, PJs and then one for sports gear. Then within these I’d organise so I have a pile of printed t-shirts, a pile of plain t-shirts, a pile of striped t-shirts… etc. decide what sort of system works for you and as you decide on keepers, fold and sort them like this ready to be put back in place. 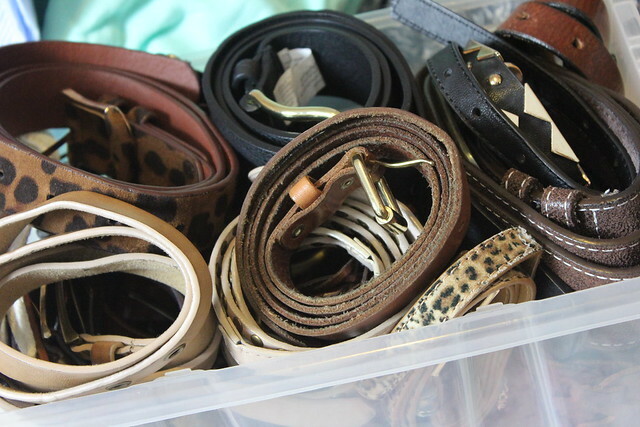 I also keep all my belts in a plastic box in the wardrobe – post-clear-out, I have rolled these all up and stored neatly, rather than just stuffing them in a hap-hazard way into the box – making different belts easier to find. What makes something a keeper vs. get rid of? If you haven’t worn it in six months is one thing, but then you might have a summer dress that doesn’t count… so maybe make it 12 months. Or I tend to have the rule that if it’s something I’ve *tried* to wear, but just didn’t feel good in and ended up changing, then it has to go – no point keeping confidence-suckers in the wardrobe – even if you love them. If it’s too small/too big and you don’t seriously plan on returning to your teenage size/eating loads of cake then maybe it’s time to pass it on to someone who it will fit perfectly and flatter more than you? I’ve been guilty of both hanging on to my ‘skinny jeans’ that even when I fit them were just downright uncomfortable, or buying tops or dresses a size or two up because it’s all they had in and I wanted it – neither is ideal, so for me – a clear-out is time to get rid. This is mainly a tip for those that don’t have much space. 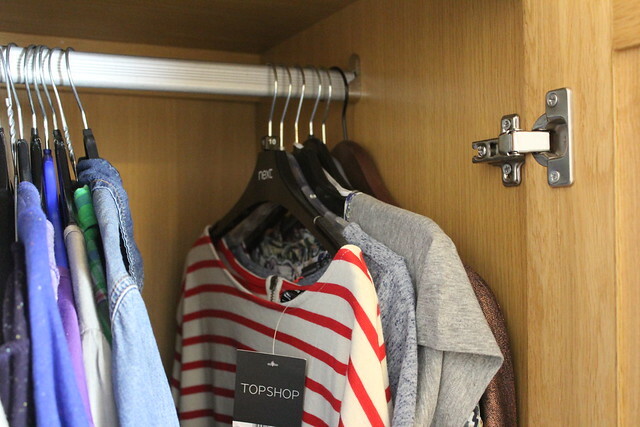 When I first got this wardrobe I stocked up on all these lovely wooden hangers, thinking they look lovely to hang and nice and neat. 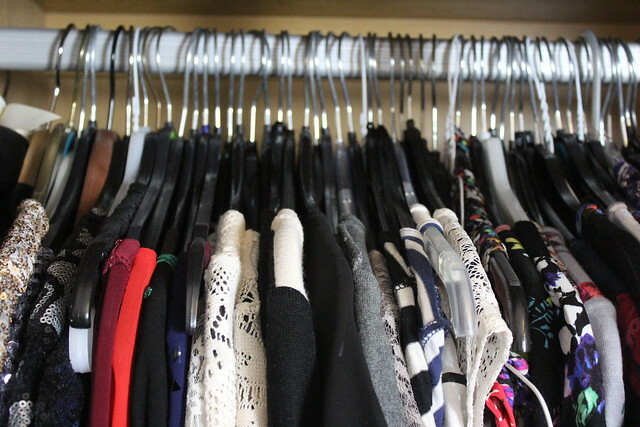 Sure, they do – but they also take a significantly bigger chunk of space than a wire one – and since my wardrobe is apparently more about quantity than quality, I decided to pass on the wooden hangers to the boy and ‘downsize’ to simple wire ones. Handily, the boy gets an influx of these from his dry-cleaning place every week so I can still sort of look to get the whole uniform ‘all matching hangers’ effect – but with taking up less space at the same time. Otherwise, I’ve seen that Primark sell some hangers that look pretty decent – they’re sort of velvet material to help things cling rather than slide off. Plus they’re quite narrow (space saving) and affordable. So this could be an option for you if you’re not a fan of the simple hangers. And I don’t just mean that you can now hit the shops and fill all that new space immediately! What I mean is, if you’re anything like me then you might have an item or two in there that you bought and haven’t worn yet. If these are items that are recent purchases rather than mistakes (things I’ve bought and never worn, for years – they have to go out) then I hang these few togerher on the right hand side of the main bit of my wardrobe so I don’t forget about them. Then on ‘I have nothing to wear’ days, I know I have a couple of options of brand news items I can reach for, so I can have that ‘new clothes’ feeling. I have a topshop dress my brother bought me for Christmas (excellent work David) that I am just waiting for the right moment to wear, and I have a feeling it will be a firm favourite. Finally – don’t forget the whole wash/repair side of things. There might be items that need dry cleaning, or you like but maybe a hem needs fixing or a small hole needs sewing up. They’re not lost causes, but maybe take them to your local dry cleaners – and get them to do the fixing too. If you’re anything like me, if I took a needle and thread to something I’m likely to do more damage than good. Sometimes it’s good to ask your mum to fix them trust the professionals. When you’re all done, you will most likely be left with a bag or so of unwanted items, don’t just throw them out – take them to a recycling centre or charity shop so they can be put to good use in one way or another. Some charities offer a collection service – so just check online for something that might work for you. Thank you for these nice tips! Today I clear my wardrobe out! I really enjoyed this post – great tips! 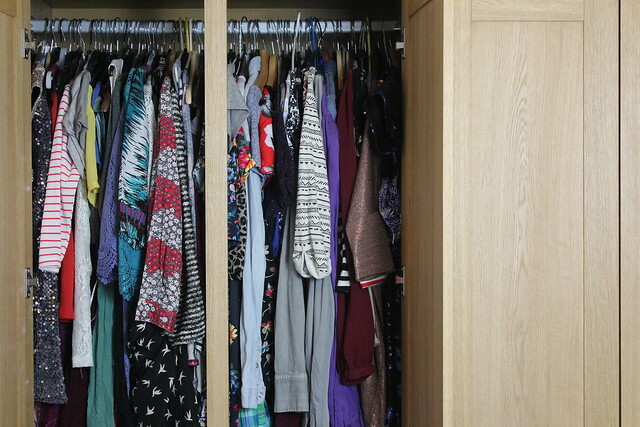 I have the same wardrobe organisation system as you, though for drawers I place my tops in piles going across rather than up – means I can see everything! Ooh, that’s a good idea! Might see if I have space to do that! I actually found doing it saved space – I managed to get my jeans, skirts, scarves and tops all in one drawer like this (and I have a lot of clothes)!